Ryan Malmsten and Andy Alexander, licensed real estate brokers in the Santa Barbara, California, market, have joined the prestigious Haute Residence Real Estate Network. The Haute Residence Real Estate Network of Hauteresidence.com, affiliated with luxury lifestyle publication Haute Living, is proud to recognize Ryan Malmsten and Andy Alexander as prominent real estate professionals and the network’s newest partner. Ryan Malmsten, broker and co-owner of Santa Barbara Brokers luxury real estate, grew up in Denver, Colorado, and graduated from Westmont College––located in beautiful Montecito, California––in 1989. While attending Westmont, Malmsten played soccer and studied economics and business. After graduation, he lived in Montecito and enjoyed getting to know the Santa Barbara lifestyle to its fullest. He then moved to the Vail and Breckenridge resort areas of Colorado to start his real estate career. Malmsten attained the number one top producer position for one of the premier mountain real estate companies with more than 80 agents. He has been in the high-end luxury real estate market for more than 20 years and has successfully closed more than 350 transactions, totaling more than $164,000,000 in sales. 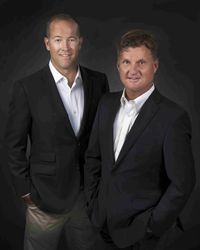 In the summer of 2010, Malmsten started Santa Barbara Brokers, Inc with his good friend, Andy Alexander. Malmsten continues to maintain an incredible network of buyers and sellers in Santa Barbara, Vail, and Aspen and uses his resources to maximize the best opportunities for his clients. He diligently represents these clients in the purchases of first and second homes. Malmsten enjoy skiing, golfing, surfing, and playing polo, but mostly enjoys spending time with his wife Holly and his four daughters Maddie, Riley, Jayna, and Sage. The Malmsten family lives in Montecito and loves every aspect of the California lifestyle. Andy Alexander, broker and co-owner of Santa Barbara Brokers luxury real estate, grew up in Colorado and attended the USAF Academy, graduating in 1993. After college, he moved to Southern California and went to graduate school at the University of Southern California. After graduating and serving in the military, Alexander took a job at an investment firm and acquired his Series 7 license. After three years at the investment firm, he decided to pursue real estate full time. Buying real estate investments started as a personal hobby in 1996 and turned into a full-time job by 2000. Alexander applies his personal experiences with making money in real estate and investments toward helping clients buy and sell their property. He lives in the San Roque neighborhood in Santa Barbara with his wife Amber and his two daughters Ailey and Aeryn.